Loquat (Eriobotrya japonica): growing, planting, caring. The loquat - Eriobotrya japonica - is a species of flowering plant in the family Rosaceae, native to the cooler hill regions of China to south-central China. It carries a beautiful persistent foliage and provides a dense shade. Eriobotrya japonica is a large evergreen shrub or small tree, with a rounded crown, short trunk and woolly new twigs. The tree can grow to 5–10 metres (16–33 ft) tall, but is often smaller, about 3–4 metres (10–13 ft). The fruit begins to ripen during Spring to Summer depending on the temperature on the area. The leaves are alternate, simple, dark green, tough and leathery in texture, with a serrated margin, and densely velvety-hairy below with thick yellow-brown pubescence. Fruits are edible. 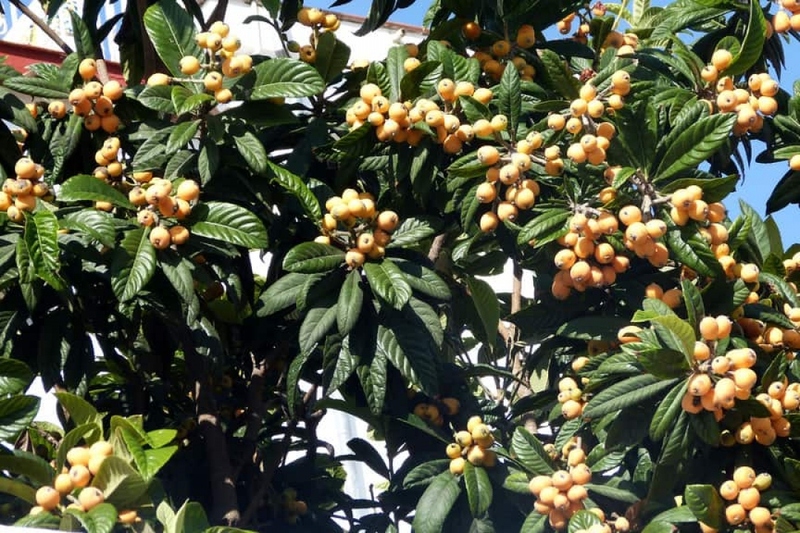 The loquat is a tree that reaches 10 meters in height in a favorable climate, and takes a habit rather "rounded". It originates from China. It has very special evergreen leaves, lustrous and slightly embossed, oval, slightly toothed and measuring about twenty centimeters in length. The stems are covered with a clear down. The flowers form at the end of the branches, in autumn. The fruits - nicknamed "bibaceous" in the south of France - are formed between November and April, they are sensitive to frosts inferior to -3 ° C. The fruits must be consumed quickly because they are not very resistant to handling. Be careful, loquat seeds are toxic! In open soil, plant in spring in drained soil, humus, preferably acidic, in the sun. The loquat tolerates neutral or alkaline soils, but is more vigorous in acid soil. Dig a hole 20 cm larger than the root ball, and plant without burying the base. Provide a solid stake to your tree, driven down the hole. Tie it with one or two soft links. Tamp the soil well as you plant in the hole. Do not mix the soil layers. Form a large hollow, and water with at least two watering cans. In pots, plant in loam mixed with potting soil, and put gravel at the bottom of the tank for good drainage. Choose a pot as large as possible. You can grow it for a few years in a large container of about fifty centimeters, but eventually it will be limited by the size of the container. Water especially at the plantation, and once a week the first month. The first year, keep an eye on your loquat. Harvest regularly between autumn and spring and consume fruits quickly, because they deteriorate quickly enough. Prune in the spring, after harvest, by shortening the ends of branches, and eventually lightening the heart of the tree. Remove the intersecting branches and those that have dried. Watch for signs of fire blight: the shoots at the ends of the branches dry for no apparent reason. In this case it is necessary to burn the affected parts very quickly. The fruits are sometimes attacked by small flies that lay in it. You can not treat, you just have to avoid the "visited" parts. Aphids cause "sooty mold", which produces black spots that can be cleaned with black soap if the tree is not too big.